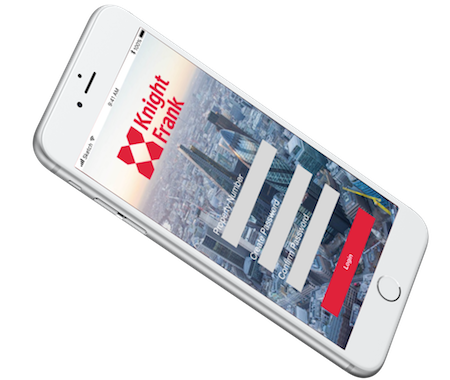 Created a mobile app for the estate agent Knight Frank to help new tenants process their paperwork easily and quickly and be ready to move in on time. To improve their process of renting residential property using a mobile device, while retaining the human element of the process. The Discovery & Research phase of our project began with a visit to a local Knight Frank office. 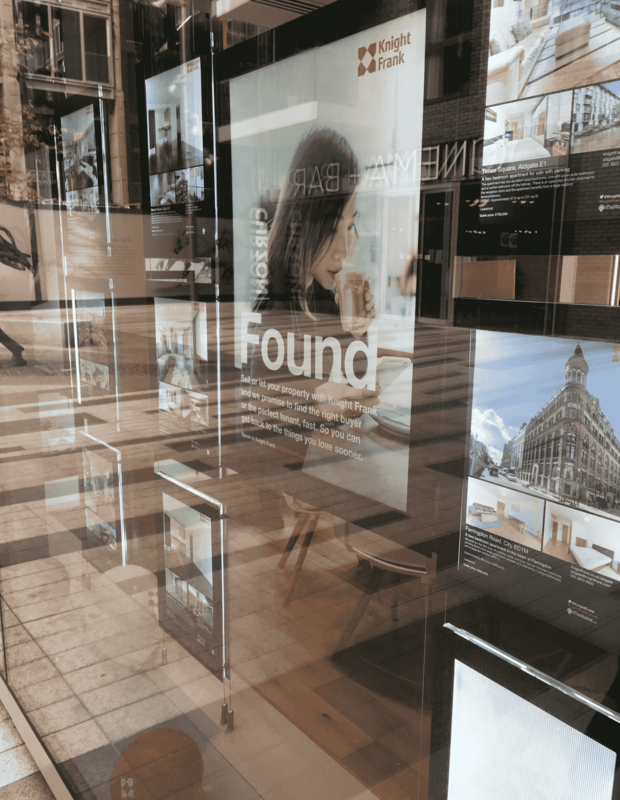 For our competitive analysis, we looked at some of Knight Frank’s direct competitors in the industry, including Foxtons, Morgan Randall and Nelsons. Here, we focused on their customer service and digital capabilities. We also researched a rental app called Rentr that connects landlords and tenants directly. 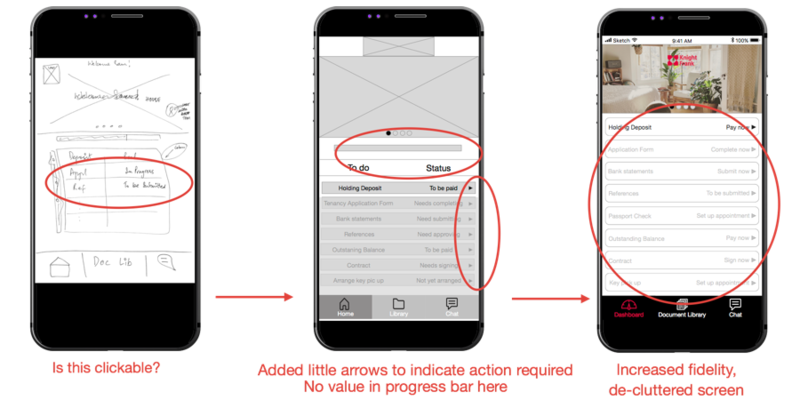 This app included some key features like digital payments and process tracking which was very useful to us later on in the design process. We began speaking to many users who had recently been through the process of renting a property. Most had had fairly negative experiences, both with the process and the agent they had used. "I’ve only had bad experiences with letting agents, the only good experience was leaving them"
"I had no idea where I was in the process or how long it would take"
I was very unsure about the paperwork — what needs to be done, who send this, who do I send this to, and nobody to tell me! 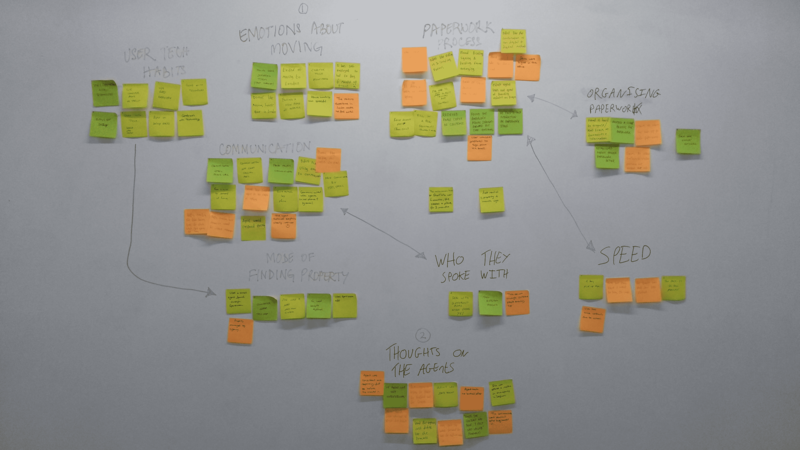 We built an Affinity Map of the findings from our user research to understand the underlying themes of users’ experiences. 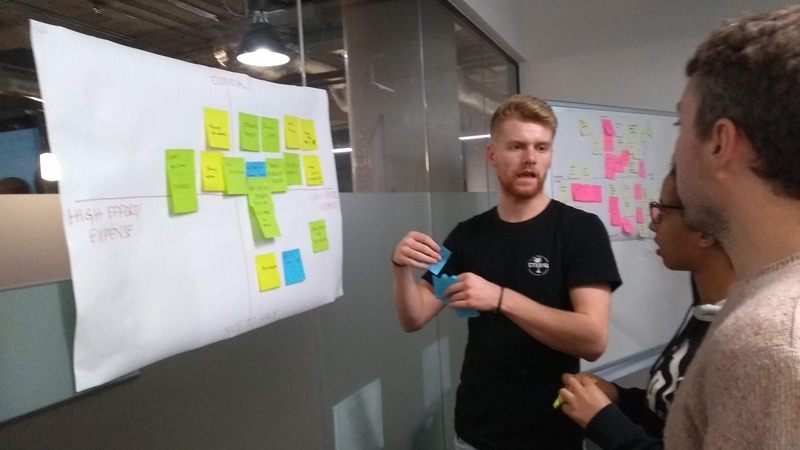 Condensing this further into key insights helped us understand the main pain points that we could work towards addressing in our design solution. At this point, I found it useful to build a visual representation of the users’ current journey while completing the required paperwork to rent a new property. An Experience Map captured this long arduous process perfectly. Based on the findings from the Discover phase of the project, we began working towards defining the user problem and possible solutions. Using the user research, we created 3 user personas that incorporated our user interview findings and reflected our interviewees’ goals and frustrations. From these, we decided to focus on our primary persona Sam because she was an individual renter (Theo was renting with friends, and Tom was an estate agent). As Sam’s persona was drawn from actual user research, it enabled our team to ensure that all design decisions were were user-centric. 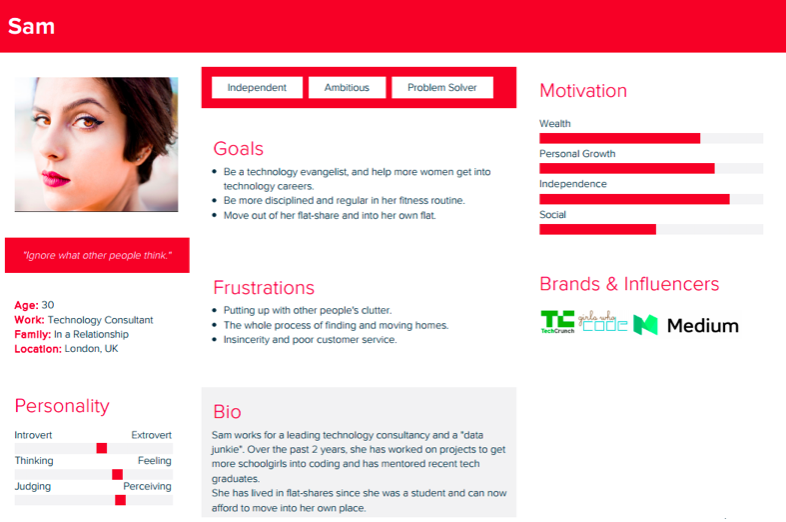 Sam is tech-savvy and looking forward to moving in to her own flat. She hates clutter and bad customer service. Her motivations are independence and personal growth. Sam has to move out of a flat-share in 3 weeks time so she has been looking at flats with Knight Frank agency. Sam’s offer on a 1-bed flat has been accepted. She now has to process the paperwork and be ready to move in 3 weeks. The team then came up with a list of features that the solution had to incorporate to create a minimum viable product. We went through a couple of iterations in this feature prioritisation exercise to ensure we focused on what Sam would need to solve her problem. With the outline of a solution at hand, we created an updated version of Sam’s user journey in our app. Dividing it into specific sections helped us create workable user flows that we could start sketching screens for. 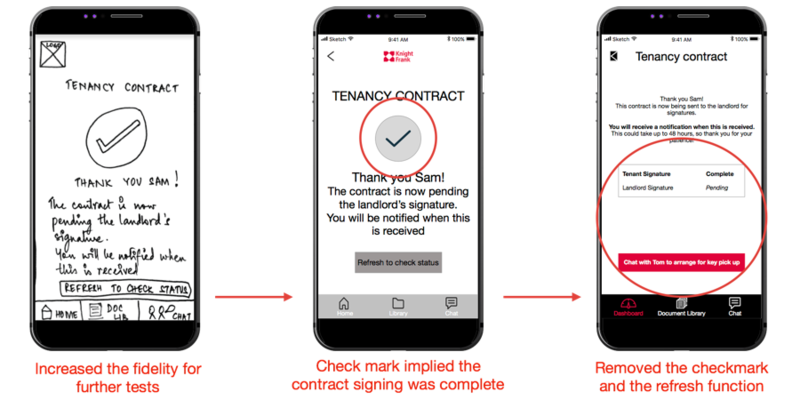 By this stage, it was quite clear that the length and complexity of the entire renting process needed a dedicated new tenancy app that would store relevant information documents, and utilise the capabilities of a modern smartphone device. 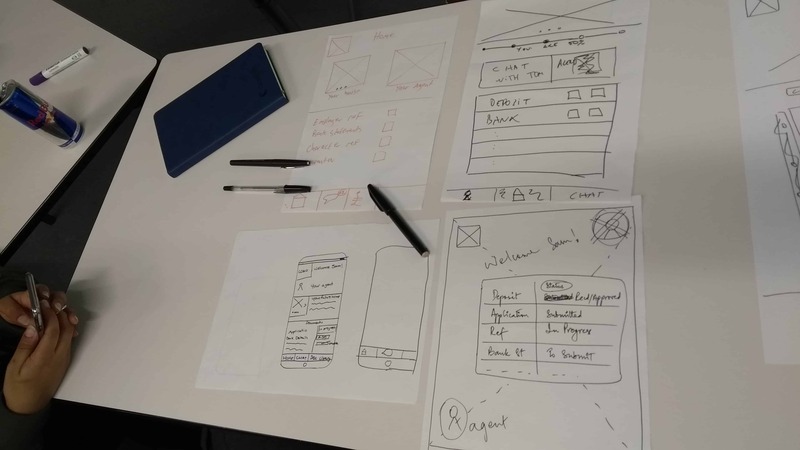 With a clear problem to solve, a rapid group brainstorming session in a design studio format generated lots of quick and interesting ideas on screen formats. 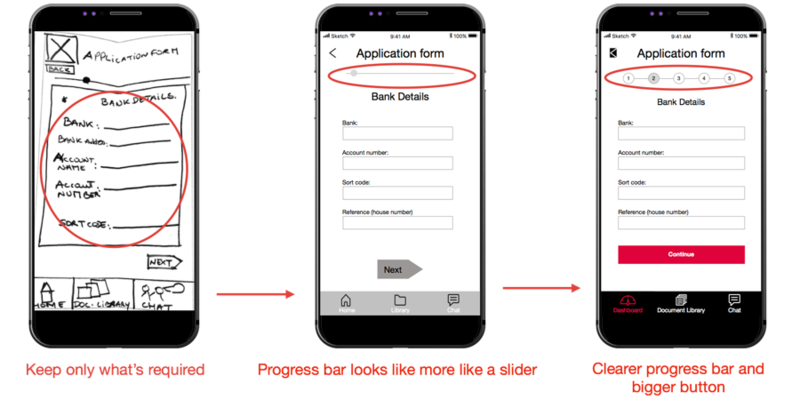 In trying to re-design a paperwork-based process, one of the main challenges in this app was to get the right amount of information on the screen while keeping the layout and navigation simple and intuitive. 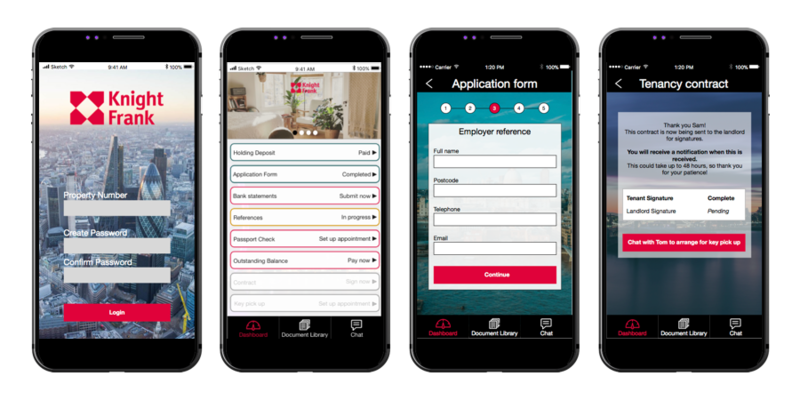 For this reason, we focused on the tenancy application form screen and the progress tracker screen for the design studio - these were the most complex parts of the user journey. 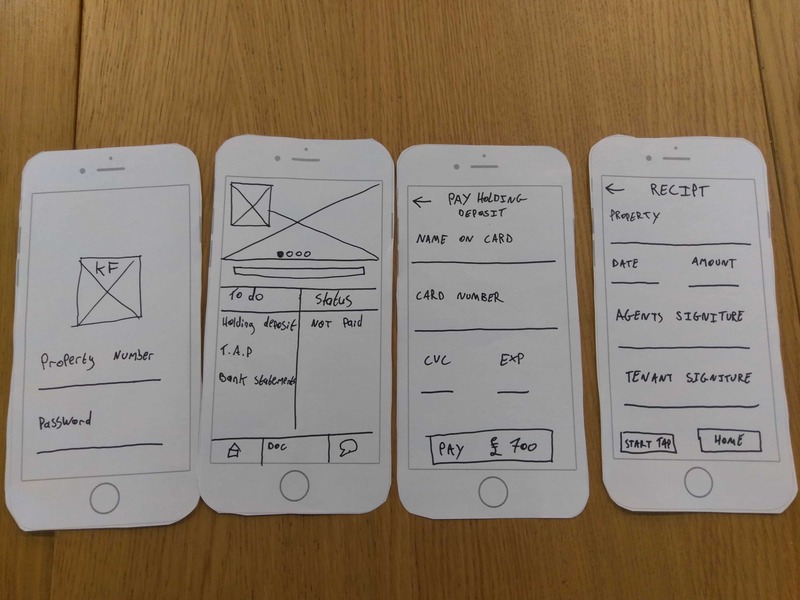 With some initial user feedback incorporated, we created paper prototypes for our primary user flows and started testing them with a few users. Early feedback on the paper prototype helped us make quick changes to the screens and also explore alternate layouts and placements. 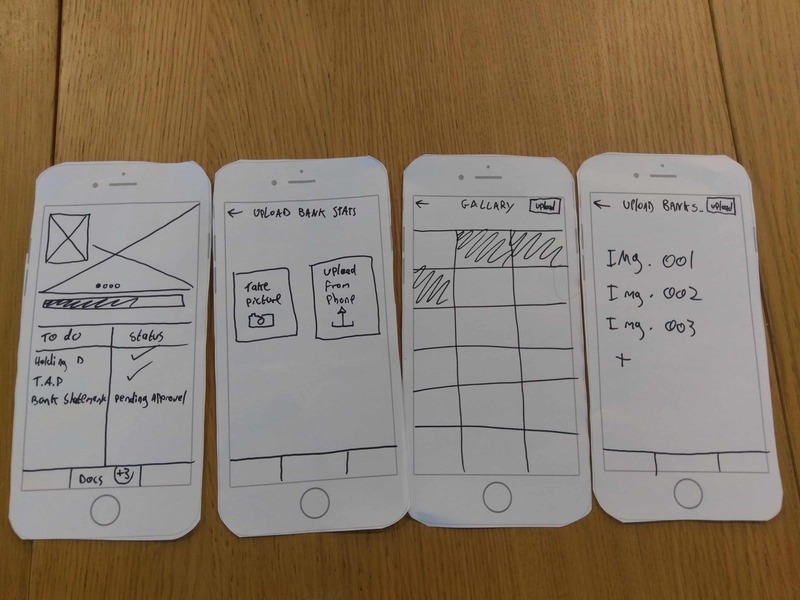 Bringing these to low-fidelity digital wireframes and testing them continually (both specific screens and overall screen flows) helped us iterate and progress towards a better user experience. 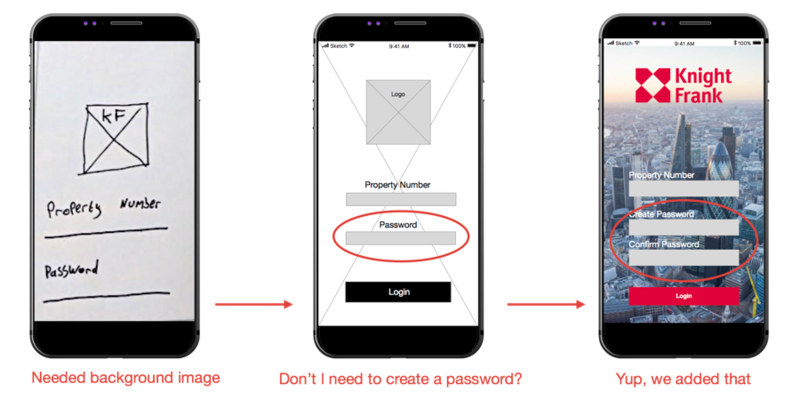 Click here for a peek into our clickable prototype. 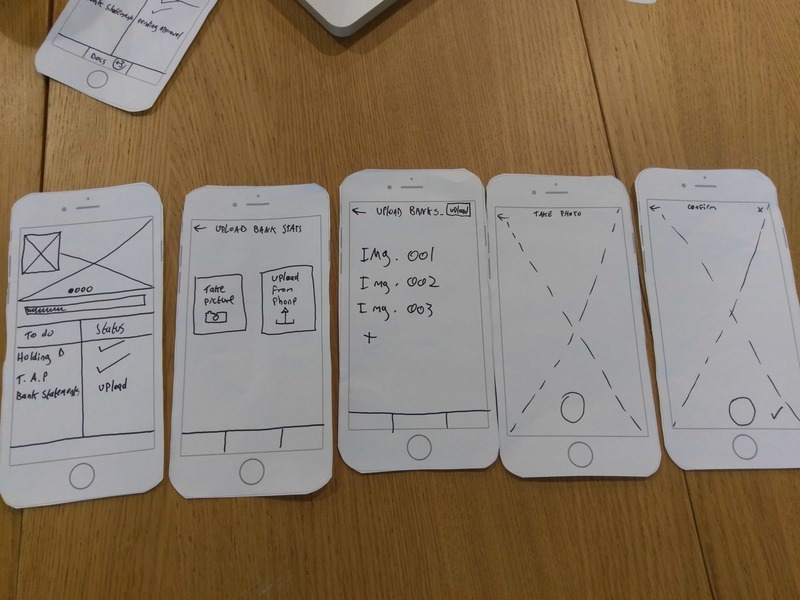 I learnt a lot during the 2 week design sprint, flexing my UX design muscles while learning new tools and techniques that would take the product design further. Doing this in a group environment, with multiple view-points and stakeholders, brought a real-life perspective to the project. "I really wish I had this app every time I moved homes!" 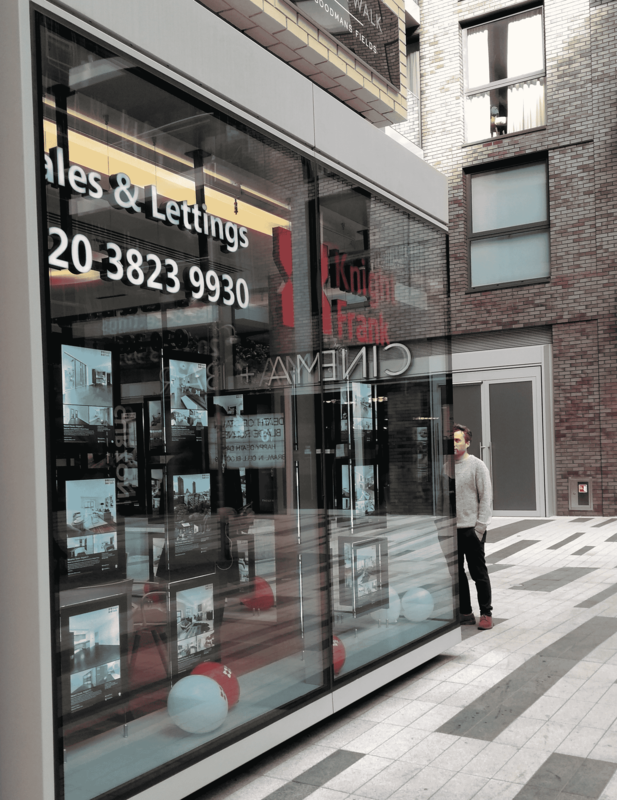 "Every estate agents needs this app."